I’m a small town guy. I grew up in a town of 5,000 and I am raising my family in a town of 10,000. Don’t worry I’m not going to start singing “Small Town” by John Cougar Mellencamp but the lyrics would work for the direction this blog is going. During my time at GVMH I’ve had both the honor and pleasure of recruiting staff to our organization. We are a comprehensive health care provider and large employer in a small community. Due to the nature of our business and expertise required to provide specialized services we recruit from across the country and in some cases across the world. Whenever I’m involved in recruiting someone to GVMH I spend a lot of time helping them understand all the reasons GVMH is a great place to work. I also spend a lot of time helping them understand why Clinton is a great place to live. When you stop to think about it the reason why both are true are intertwined. Clinton is a great place to live because we have a progressive community with several big city amenities. One of those amenities is the community center which also houses the indoor aquatic center. Both the community center and aquatic center are extensions of services provided at GVMH and help keep our community healthy. Clinton is just far enough away from KC that we have an affordable cost of living, yet close enough it’s easy to get to. The proximity of the two helps to improve our service offerings and care provided to the community as well. We have many visiting physicians and specialty services that would not be available if we were farther away. We also have many physicians and providers who call Clinton home because they want to practice in a rural setting yet have ready access to metropolitan amenities. The most important aspect of living and providing care in a rural setting is that you get to care for and interact with people you care about. We provide care to our friends and neighbors. Our patients are not “patients”. We interact with our patients outside of the hospital every day. You’re just as likely to see a “patient” at church, the grocery store or a restaurant as you are the hospital. You’re just as likely to see your “friends and neighbors” at the hospital or clinic as you are church, the grocery store or a restaurant. Care is provided with that little extra touch when you know you’re going to see the person you’re caring for outside of the health care setting and care is sought by the community from people they know and like. Here’s a great example of why living in a small town is important to me. We don’t eat out often but when we do we frequently go to Smith’s Restaurant. Leland and Gayla Smith are great people, the food is excellent, portions are reasonable and the prices are fair. My oldest son thinks Leland Smith is one of the greatest people he knows so every time we decide we’re going out he requests Smith’s. Leland always takes the time to sit down and talk to my son and shake his hand which is a big deal to a soon to be 5-year-old. Leland started another ritual with my son a couple of years ago and I’m not sure which one of them appreciates it more. If you know Leland you know he’s a car buff and he restores cars as a hobby. 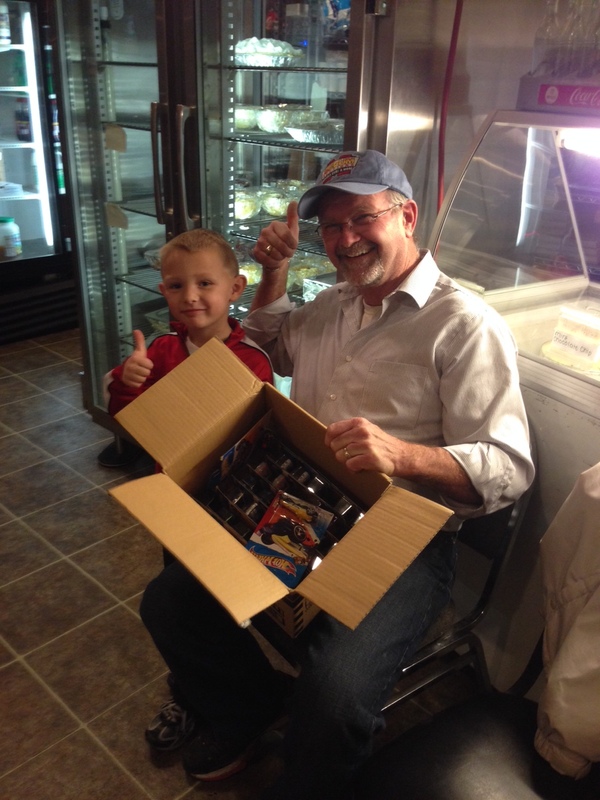 One evening while visiting Smith’s Leland pulled out a box of Matchbox Cars and asked my son to pick one. Now every time we eat at Smith’s Restaurant, and Leland’s there, my son gets to pick out a new car to add to his collection. And the below picture is why I love living in a small town! I’ve donated so much time to the Chamber that I could be classified as an employee!